- জনঘনত্ব ৬,২১১ প্ৰতি বৰ্গ কি.মি. ↑ "Province Population". http://report.tuik.gov.tr/reports/rwservlet?adnksdb2=&report=turkiye_il_koy_sehir.RDF&p_il1=34&p_kod=2&p_yil=2009&p_dil=1&desformat=html&ENVID=nufus2000db2Env। আহৰণ কৰা হৈছে: 11 February 2010. ↑ "İstanbul – Archaeology Museum". Republic of Turkey Ministry of Culture and Tourism. 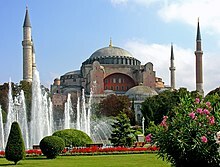 http://www.kultur.gov.tr/EN/belge/2-19958/istanbul---archaeology-museum.html। আহৰণ কৰা হৈছে: 19 April 2012.